Frodo! What is best in life? I ran into this somewhere online and of course, I saved it. Cause it makes me grin. I can imagine Arnold's Conan hewing his way through orcs with lots of Schwarzeneggery vocal effects. "Nnngggraahhh! Awhhooghh! I kill you all! Get to the Choppah!" Maybe not the last one. 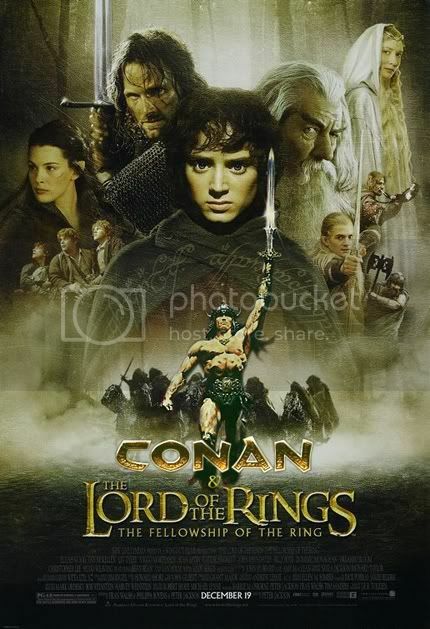 Truthfully though, I'd really like a fantasy movie with the scale and heroic theme of the LOTRs movies, and the gritty, joyous hack and slashery of the first Arnold Conan movie. Lets not talk about the second one. I have a bad feeling about the oncoming Conan movie with Jason Momoa from Stargate Atlantis. I don't doubt Momoa is gonna give it his all, and from the pics of him I've seen in the role, he's looking the part, mostly. It's just that the hollywood braintrust has done their usual hatchet job on Howard's work. Made up their own characters, pasted on the standard "seeks revenge" plot, and altered Conan to make the non-Howardian elements fit. I just don't see why all of Howards Conan stories couldn't be treated in the same way they did Arthur Conan Doyle's Sherlock Holmes stories in that Jeremy Brett series. Or the Brother Cadfael stories, or the Hercule Poirot stories. 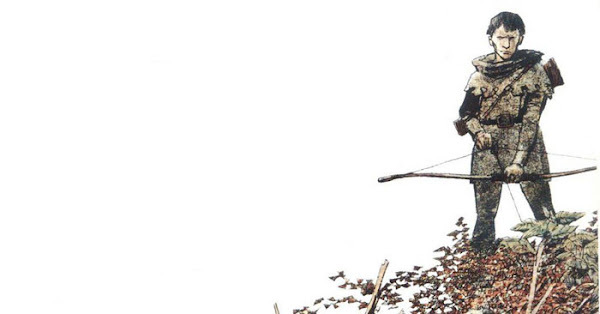 All most all the Conan work is short stories anyway. Why not a faithful run of one hour episodes? You don't have to have minis to play The Game, but I think they're an enjoyable extension of the hobby. They also support the tactical combat facet of the game. I don't always use them, but there are definitley situations where having physical markers on a map to judge distance and spacial relationships in melee makes things much easier on the DM and forestalls disputes on the part of the players. You don't get to argue about wether or not you were in range of that fireball. Look at the minis, man. 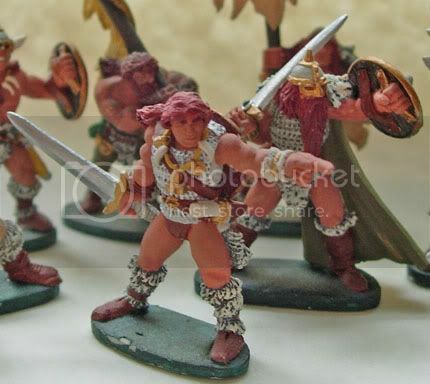 You can use dice or what have you, but minis are part of the history of the game. I think they're one of those things which are inherently D&D. A traditional accoutrement if you will. I like accoutrements. 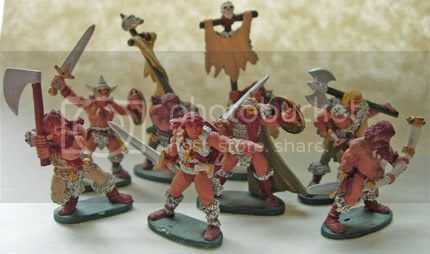 These are pics of a few minis from my horde. I've got a lot of them. 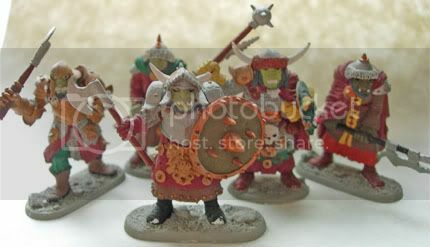 This group is mostly Ral Partha, Grenadier, and maybe Reaper or Games Workshop. I judge minis on a case by case basis. I'm not loyal to a particular maker. These are from before I started using washes or much dry brushing. I'm just going to leave them as they are now though. My mini collection is kind of a record of my skill level at the time I worked on each one. They've all got memories attached to them as well. Where I lived when I painted them, what was going on in my life, etc. They're like little lead memonics to me. I like the work itself. The painting and fine work cleaning up the mold lines or splicing weapons is fun. Minis, like this blog, are one of those side pursuits associated with The Game that you can enjoy without actually playing. They're also low cost. When I was a kid, I built tons of plastic model kits. I had one of those big movie Enterprises with the lights hanging in my bedroom. The cost of kits is ridiculous now though. A 1/35th scale tamiya tank kit runs $49.99. Fat chance of that. These two are older and cruder than the barbarians and the ogres above. The knight I just did for the NPC pool. The elf is one of several minis I've used to represent my oldest character. A grey elf fighter-magic-user called Byrandir or Bryn the Axe. He made it all the way to 10th level before I retired him. I know that's not high level by many perspectives, but it's the highest level character I ever had. My Greyhawk has no pity. I love these little chunks of metal. Just in contemplation of them I'll sometimes have a thought that sets me off on some inspirational tangent of game ideas. 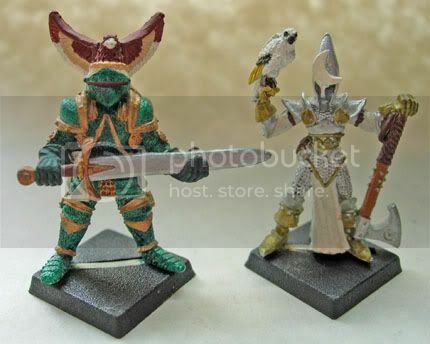 Do you guys have a particular source for minis that you prefer? I've never bought them on line. I prefer to handle things up close before I spend money on them. At this point however, all the FLG stores withing striking distance of me seem to have reduced their in store offerings to a small selection of stuff that doesn't appeal to me. I'd spend some time kicking game stores but I'll save that for another post, it's late.